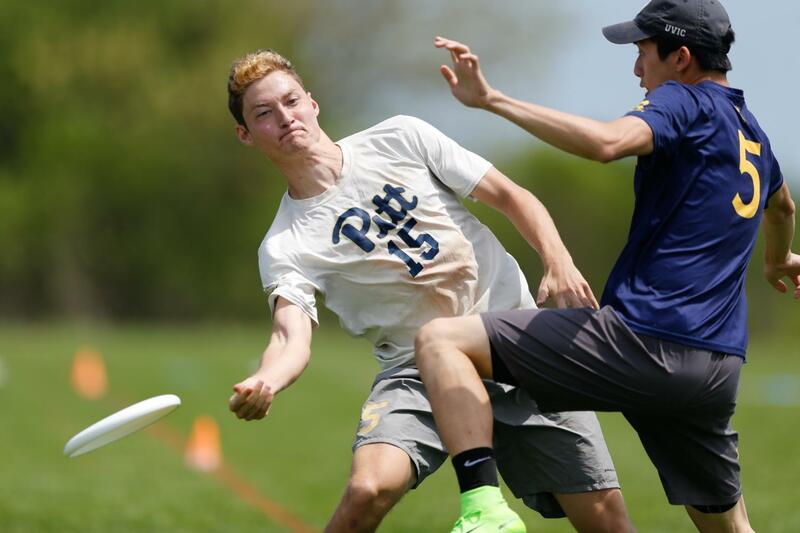 This weekend in Milwaukee was hot — over 80 degrees in the sun, and hotter on the turf fields of the Uihlein Soccer Park, where the Pitt Ultimate frisbee men’s and women’s teams competed for a shot at their respective national championships. But according to rising fifth-year senior Hafeez Shams, it didn’t make a difference. “Ever since we started playing Ultimate we had dreamed of playing on that field on that stage, so the heat wasn’t exactly the first thing on our minds,” he said. The women’s team — also known as The Danger — proved many people wrong at Nationals this year, starting out as the 10th seed. They won their pool with an undefeated 4-0 record, beating No. 3 North Carolina 13-11 and coming back from a four-point deficit to beat No. 6 British Columbia 16-15. The Danger went on to upset No. 5 Oregon in the quarterfinals 15-10, which meant that they finally made it to the semifinals for the first time in program history this Sunday. They would go on to play another underdog, No. 12 Colorado, for a shot at the championship final. The game went back and forth until it was a tie score at 12-12 at the end of full time. The game then went into universe point, which is sudden death in Ultimate, and Colorado ended up scoring first to beat Pitt and go on to the title game. Despite the loss, rising sophomore CJ Dawson was still happy the team made it as far as they did. The men’s team — also known as En Sabah Nur — was also an underdog this year coming into Nationals this weekend. They started out as the No. 9 seed in the group of death, playing against teams like No. 4 Brown and No. 5 Washington, who they beat on the final day to win the group. En Sabah Nur then easily beat No. 10 Wisconsin 15-8 in the quarterfinals Sunday morning, and went on to upset rival No. 1 Carleton College 15-11 in the semifinals Sunday evening to take on North Carolina in the final round. But En Sabah Nur lost 14-10 to the University of North Carolina Ultimate team, Darkside, at the USA Ultimate Frisbee Division 1 College Championships this past Monday. Darkside opened the game on a 2-0 run, thanks to two Pitt turnovers on the first two drives. Pitt was eventually able to get on the board thanks to a good outside pass from Noah Robinson to Leo Warren. Even though the lead changed hands for a while, Pitt managed to score its third goal to make it 4-3 after a long possession. But the lead from Darkside stayed consistent throughout the rest of the game. En Sabah Nur gained more control after falling behind 6-3, forcing Darkside to commit six consecutive turnovers. Pitt then scored two goals from Michael Ing to cut the lead to 6-5 — but Pitt’s control didn’t last long. North Carolina eventually stopped their turnovers and ended the half with two more goals from Matt Gouchoe-Hanas and Nathan Kwon to lead 8-5. Pitt started the second half with a long throw from Wisch to Robinson, giving Pitt another point. But Gouchoe-Hanas and Kwon of North Carolina both scored their second goals not long after, bringing the game score to 9-7. North Carolina scored three additional goals, coming from Alex Davis, Norman Archer and Gouchoe-Hanas — who scored his third goal of the game. With the 12-7 score, Darkside only needed two more goals to win the game. Pitt worked hard to try and mount an incredible comeback. After two long connections from Shams to Dillon Tranquillo and a goal from Dan Goldstein, Pitt was able to quickly score three goals, but the team still trailed behind two points. But Darkside went on to score the last two goals they needed to win the game and the national title. Although it ended in a loss, Pitt showed that it still is a national powerhouse in Ultimate after making it to the final for the first time since winning it in 2013. Shams was happy to move beyond Pitt’s last few years of missed opportunities at the championship game, and was proud the team exceeded expectations.